Parkside, Qualicum Beach is just a short drive or a brisk walk to downtown, the beach, or many of Qualicum Beach’s recreational amenities. 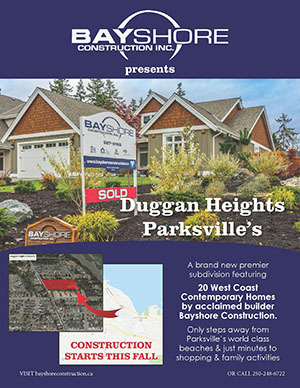 Parkside is nestled amongst Qualicum Beach’s lush parkland and connected by manicured trail systems. Parkside, Qualicum Beach truly is the perfect blend of both privacy and accessibility. Custom colour schemes selected for each home. Wide plank, wire brushed oak hardwood flooring in great rooms, dining rooms, and kitchens. Low profile 100% nylon carpet in bedrooms and den (some homes). Satin nickel lever hardware by Emtek. Porcelain tile flooring in entry, laundry room, and baths. Clean lined 6″ baseboards and door/window trim throughout. 9′ ceilings on the main floor, with 11′ ceilings (some homes) in the great room. Natural gas fireplace with natural stone tile surround (colours may vary). GE Profile stainless steel hood fan. GE Profile stainless steel dishwasher. Porcelain mosaic backsplash to underside of cabinets. Custom designed shaker style kitchen cabinets. GROHE single lever stainless steel faucet with integral vegetable spray. Soaker tub and shower (some homes) by Hytec. Contemporary polished chrome faucets by GROHE. Low flush, soft close toilet by Toto. Pressure balanced polished chrome shower control by GROHE. 5′ soaker tub by Hytec (some homes). Natural honed travertine floor tiles (colours may vary). Walk-in tiled shower with polished chrome and glass shower door. Dual above-counter lavatories (some homes). Energy efficient, double-glazed vinyl windows. All homes pre-wired for security system. Roughed-in for central vacuum system. Hard-wired smoke detectors in all homes. Third-party warranty insurance providing coverage up to 2, 5 and 10 years.